- FRANCE – Mâcon - Les ouvriers de la société Socafl qui œuvrent actuellement rue Gambetta à Mâcon pour les travaux d’assainissement vont de découvertes en découvertes au niveau des vestiges. Depuis la mise au jour d’un sarcophage jeudi dernier, quatre autres découvertes ont suivi dont deux nouvelles pour la seule journée de lundi. C’est avec méthode et grande délicatesse qu’un sarcophage de taille normale et un autre de plus petite taille, ce qui laisse à penser qu’il s’agirait d’un enfant, ont été déterrés puis transféré dans un local appartenant au Musée de Mâcon Pour l’hôte de Daniel Barthélémy, président du GAM (groupement archéologique Mâconnais) « ces découvertes confirment la présence de chapelles chrétiennes qui remonteraient vers la fin de l’antiquité. Maintenant il nous faut trouver un anthropologue pour superviser le travail de fouille des sarcophages et interpréter les ossements ». - TUNISIE – Carthage - Les agents de la brigade judiciaire à Carthage ont découvert et saisi, lundi 2 mai 2011, 37 pièces archéologiques au domicile de Mohamed Moncef Materi, père du gendre de l’ancien président, sis à Carthage Dermech. Le chef de la brigade, Houssem Chokki, a indiqué, dans une déclaration à la TAP, que l’opération de perquisition se poursuit en vue de trouver d’éventuelles autres pièces, sachant que celles déjà retrouvées, présentent une grande valeur historique et archéologique, s’agissant de sculptures sur marbre datant des ères ottomane, hafside et même romaine. L’importance de ces découvertes a amené les agents de la brigade et les spécialistes en archéologie à décider la poursuite des fouilles dans le domicile où les pièces ont été enfouies sous terre par des gens payés par les Materi après le 14 janvier. A noter qu’il n’a pas été possible d’interroger Mohamed Moncef Materi et son épouse puisqu’ils se trouvent à l’étranger depuis trois mois. 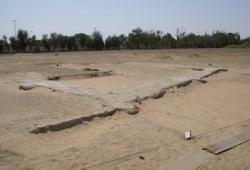 - UAE - Al Ain - The remains of two Abbasid houses have just been found in Al Ain, along with several pots and artefacts. The archaeological discovery is a big news for the UAE as it is the first proof so far of monuments from the Islamic period existing in Al Ain. The two houses were built from mud and clay, each with one-metre high walls with semi-circular props used in strengthening and decorating them. The use of props is one the characteristics of Islamic architecture in the Umayyad and Abbasid eras. 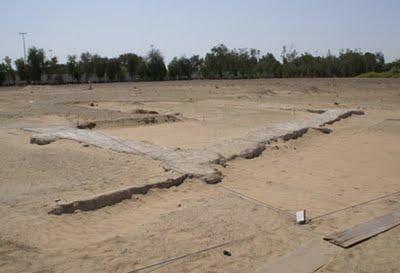 Apart from the two houses, it is believed that a mosque, a water channel and other features also exist, still buried underground, and they may all be part of the historic city of Tuwam that did not have any physical evidence, but it is mentioned in history books. In pre and post Islamic times the area was known as Tuwam. 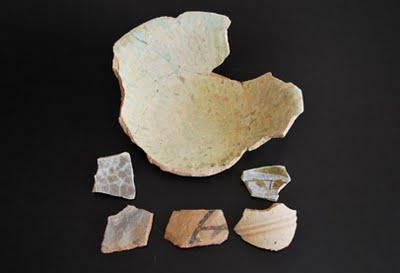 Mohammed Al Neyadi, director of Historical Environment at ADACH, explained that several earthenware items have also been discovered within the ruins of the two houses, which also date back to the same Islamic period. Some of this pottery is glazed in green, blue or grey, which is a typical glaze of the Abbasid times. 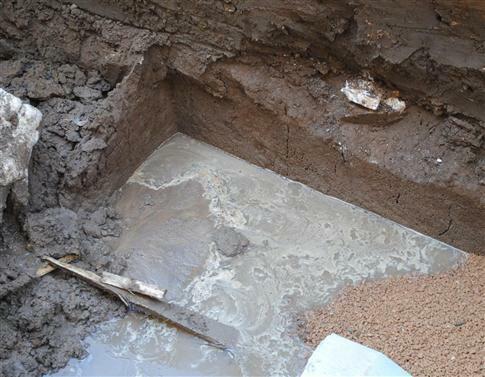 - TAIWAN – Tainan - Archeologists recently found artifacts and pottery parts that are identified as belonging to the Niaosung culture (1400-550 BCE) during an excavation near a public cemetery in Tainan City's Jiali District (Republic of China - Taiwan). According to Chu Cheng-yi, a research fellow with the Institute of History and Philology of Academia Sinica, and the leader of the archeology team, Jiali District used to be a community populated by the indigenous Siraya people who settled flat coastal plains in the southwest part of the island and corresponding sections of the east coast; the area that is identified today as Tainan City. It is, therefore, not uncommon to find Niaosung cultural relics within the city, Chu added. The archeology team also found remains of pottery used by the Han people in the much later Chinese Qing Dynasty at a pond near the public cemetery. 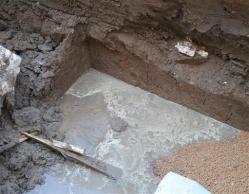 Chu and his team had also found a huge number of shells and pottery debris at the earthworks construction near the site. However, Chu noted that they have to first determine the origin of the earthworks. If the earth used in the earthworks is from the nearby area, his team will be able to draw the conclusion that the there could be a huge layer containing other Niaosung-era items beneath the public cemetery. - EGYPTE – Le Caire - Tourism and antiquities police have recovered four ancient bronze statuettes stolen from the Egyptian Museum in Cairo and elsewhere, Egypt's top antiquities body said in a statement. 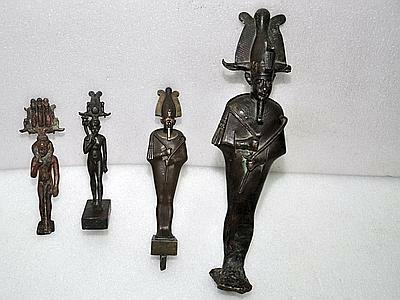 The artefacts all date to the Late Period of ancient Egyptian history (688-332 BC), and include two statues of Osiris, god of the afterlife, and two statues of Harpocrates, who represented Egypt's national patron god Horus as a child. One statue of Osiris (37.5 cm tall) and one of Horus (18cm tall), are treasures that were missing from the Egyptian Museum, Egypt's Supreme Council of Antiquities said. The recovered statuettes bring the total number of objects missing from Cairo's Egyptian Museum to 31 objects (out of an original total of 54), Egypt's Supreme Council of Antiquities said. - ROYAUME-UNI – Fort Hubberstone - Fort Hubberstone, over looking Gelliswick Bay, has been named as one of the country’s most endangered archaeological sites by a leading heritage magazine - The fort, one of 14 Palmerston forts along Pembrokeshire’s coastline, is worth preservation. The Victorian barracks, built over five years in the 1860s to boost navel defences, faces an uncertain future. It once housed around 250 men in D-shaped bomb-proof barracks above a battery of 28 guns. The fort was abandoned shortly after the First World War until it was pressed into action again as an air raid shelter and army camp for American soldiers during the Second World War.